The purchase of an aircraft represents a major commitment that should be approached carefully and cautiously, especially when buying a used aircraft. For many aircraft owners, it represents the largest single lifetime investment next to buying a home. Quite often, the purchase price of an aircraft approximates or exceeds the price of a new home. Particularly when buying a used aircraft, it is wise to have the selected aircraft inspected by a qualified person or facility before you complete the transaction. The condition of the aircraft and the state of its maintenance records can be determined by persons familiar with the particular make and model. Pre-purchase inspections should be performed by a Federal Aviation Administration (FAA) certificated airframe and powperplant mechanic (A&P) or an approved repair station. 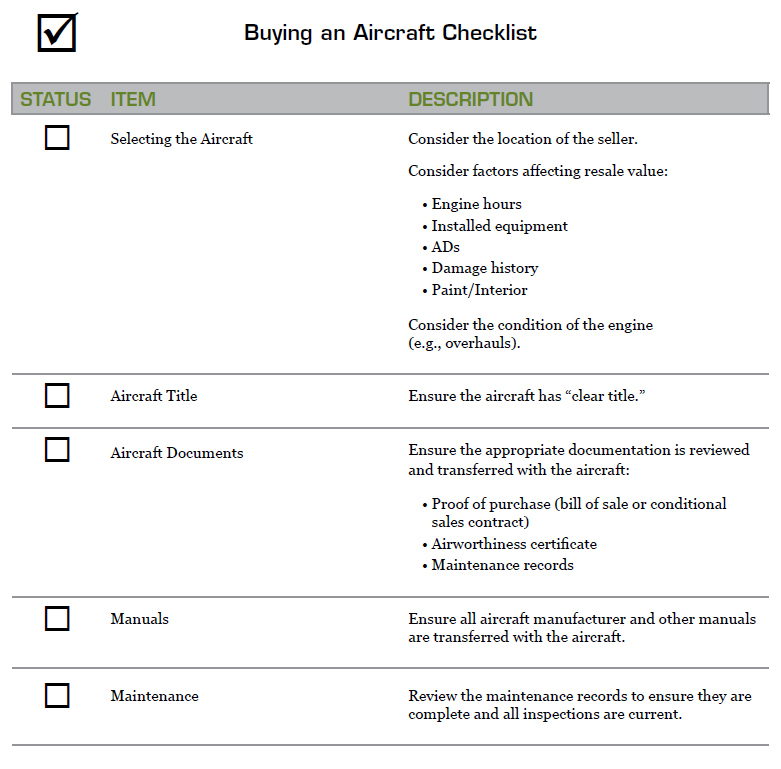 The Buying an Aircraft Checklist (Figure 2-1 at the end of this post) is a suggested list of items to consider when purchasing an aircraft. Figure 2-1. Buying an Aircraft Checklist. This checklist is intended to provide a suggested list of items to consider when purchasing an aircraft. It is not an all-inclusive list, and if you have any questions, you should consult with an experienced aviation professional prior to purchasing an aircraft. One of the most common mistakes in purchasing an aircraft is to make a decision too quickly. Take the time to analyze your requirements carefully and be realistic. Consider the typical flight loading, trip distance, and conditions of flight, then compare aircraft. If possible, rent the type of aircraft that interests you to determine how well it meets your requirements. Keep in mind that the biggest expense of owning an aircraft is not always the initial purchase price. Once you have chosen the type of aircraft that will fit your needs, shop around and do some pricing. For retail and wholesale price information, check with an aviation trade association, bank, other financial institution, or Fixed Base Operator (FBO) for the latest aircraft bluebook values. There are several good publications available that advertise aircraft for sale. Your local FBO can be very helpful as you look for the right aircraft. CAUTION: Try to keep your search for an aircraft close to home. If a problem pops up after the sale, you may not find the long-distance seller as willing to help you as someone closer to home. Engine hours—perhaps the most common influence on resale value. The closer an engine is to its recommended time between overhaul (TBO), the lower the value. There are many factors that affect engine health, and a high-time engine is not necessarily bad. Regular use helps keep seals and other engine components lubricated and in good shape. Installed equipment—such as avionics, air conditioning, deicing gear and interior equipment. The most valuable equipment is usually avionics, which can easily double the value of some older aircraft. The newer the technology, the higher the value of the aircraft. Airworthiness directives (ADs)—issued by the FAA for safety reasons. Once issued, owners are required to comply with the AD within the time period allotted. It is important to look at the AD history of an aircraft and ensure the logbooks show compliance with all applicable ADs. ADs are discussed in greater detail in the Airworthiness Directives post. Damage history—it may be difficult to locate a complete damage history for an aircraft. Any aircraft with a damage history should be closely scrutinized to ensure it has been properly repaired in accordance with the applicable Title 14 of the Code of Federal Regulations (14 CFR) parts and recommended practices. Paint/Interior—as is the case with homes, paint can be used to give “tired” aircraft a quick facelift. Check new paint jobs carefully for evidence of corrosion under the surface. Interior items should be checked for proper fit and condition. Be careful of the terminology used to describe engine condition. Do not confuse a top overhaul with a major overhaul, or a major overhaul with a factory remanufactured “zero-time” engine. A top overhaul involves the repair of engine components outside of the crankcase. A major overhaul involves the complete disassembly, inspection, repair, and reassembly of an engine to specified limits. If an engine has had a top or major overhaul, the logbooks must still show the total time on the engine, if known, and its prior maintenance history. A “zero-time” engine is one that has been overhauled to factory new limits by the original manufacturer and is issued a new logbook without previous operating history. Aircraft records maintained by the FAA are on file at the Mike Monroney Aeronautical Center in Oklahoma City, Oklahoma. Copies of aircraft records are available for review in CD format or paper. For information on ordering and costs, contact the FAA Civil Aviation Registry Aircraft Registration Branch (AFS-750). Copies of aircraft records may also be requested online. Visit www.faa.gov and select the “Aircraft Registration” link. There may be other records on file at federal, state, or local agencies that are not recorded with the FAA. CAUTION: Missing documents, pages, or entries from aircraft logbooks may cause significant problems for the purchaser and reduce the value of the aircraft. The Federal Aviation Act requires the FAA to maintain a recording system for aircraft bills of sale, security agreements, mortgages, and other liens. This is done at AFS-750, which also processes applications for, and issues, aircraft registration certificates. The two systems are linked together because you must prove ownership in order to be entitled to register an aircraft. “Clear title” is a term commonly used by aircraft title search companies to indicate there are no liens (e.g., chattel mortgage, security agreement, tax lien, artisan lien) in the FAA aircraft records. Title searches for the aviation public are not performed by AFS-750; however, the aircraft records contain all of the ownership and security documents that have been filed with the FAA. AFS-750 records acceptable security instruments. In addition, some states authorize artisan liens (mechanic liens). These also need to be recorded. Be sure to check your state’s statutes regarding liens. CAUTION: Federal liens against an owner (drug, repossession, etc.) may not show up on your title search. State law determines lien and security interests. Although there is no federal requirement to file lien or security instruments with the FAA, the parties to these transactions can file their qualifying documents with AFS-750. You may search the aircraft records, or have this done by an attorney or aircraft title search company. CAUTION: FAA registration cannot be used in any civil proceeding to establish proof of ownership. There is no substitute for examining the aircraft’s records to secure an ownership history and to determine if there are any outstanding liens or mortgages. This procedure should help avoid a delay in registering an aircraft. Filing ownership and lien documents constitutes formal notice to the world of the ownership and security interests recorded. A person who engages in a financial transaction involving a U.S. registered aircraft who does not have a title search performed is taking a risk. Under the law, that person will be charged with knowing what is on file with the FAA, even if he or she does not actually know. A simple title search will show the federally recorded ownership and lien status of any aircraft registered in the United States. When a security agreement or lien document is recorded, the FAA sends an Aeronautical Center (AC) Form 8050-41, Conveyance Recordation Notice, to the secured party. This notice describes the affected aircraft (and other eligible collateral such as engines, propellers and air carrier spare parts locations). It also identifies the recorded document by its date, the parties, the FAA recording number, and date of recordation. This recordation notice is sent as a confirmation that the lien has been recorded and added to the aircraft record. The FAA Form 8050-41 may be used as a release if the secured party signs below the release statement and returns the form to the AFS-750. The FAA may also accept as a release a document that describes the affected collateral, specifically identifies the lien, and contains a statement releasing all lienholder rights and interest in the described collateral from the terms of the identified lien. The release document must be signed in ink by the secured party and show the signer’s title, as appropriate. A new AC Form 8050-41 may be requested by contacting AFS-750. You will need to describe the aircraft and the lien document sufficiently to identify the specific document needing release.